The new historic map layer features mapping from the 1890s and covers the whole of GreatÂ Britain. Teachers and pupils will be able to overlay the historic maps over current mapping and compare changes in the landscape in their areas and beyond. 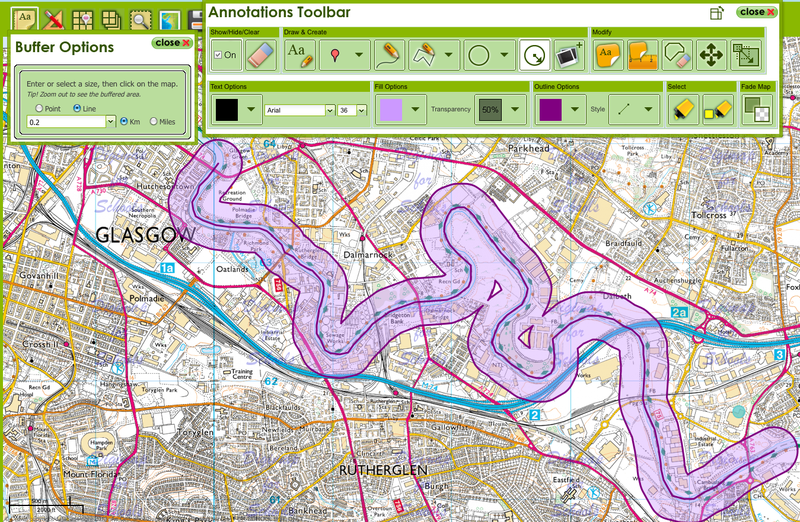 Digimap for Schools is an online application developed by EDINAÂ at the University of Edinburgh. It gives schools easy access to a wide range of OrdnanceÂ Survey mapping using a simple login and password. The service is available to all pupils regardless of age. It allows schools to access a variety of mapping scales including OrdnanceÂ Surveyâ€™s most detailed OS MasterMap and the famous OS Explorer mapping at 1:25,000 scale which is ideal for outdoor activity. The historic OrdnanceÂ Survey maps have been scanned and geo-referenced by the National Library of Scotland (NLS)and made available in Digimap for Schools. The maps were originally published between 1895 and 1899 as the Revised New Series in England and Wales and the 2nd Edition in Scotland. The historic maps are high quality scans at 400dpi for Scotland and 600dpi for England and Wales. This means that they can be enlarged far beyond their original scale of 1 inch to 1 mile. Digimap for Schools is open to all schools in GreatÂ Britain via an annual subscription. The subscription costs Â£69 for a primary school and up to Â£144 for a secondary school. Iâ€™m working on the development of a new linear buffer tool for theÂ Digimap for SchoolsÂ service. Linear buffering is a common feature in GIS applications. In geometrical terms such an operation on polygons is also known as Minkowski sum and offsetting. I came across 2 libraries that would offer this sort of functionality. One isÂ JSTSÂ andjsclipperÂ the former being a port of the famous JavaÂ JTS Topology suiteÂ and the later being a port of the C++, C# and DelpiÂ Clipper. I finally decided to go for jsclipper due to being unable to build a custom cut-down version of the huge JSTS library. The resulting tool made use of jsclipper to calculate the buffer polygon along with OpenLayers, used to draw the buffer polygon and the inner linear path. One of the challenges encountered was jaggy rounded ends on low buffer widths which is due to the way jsclipper handles floats. Fortunately jsclipper provides a method to scale up coordinates before passing them to jsclipper for offsetting and then scaling them down again before drawing. The Lighten and CleanPolygons functions also provided a way to remove unnecessary points and merge too-near points of the resulting buffer polygon. Whose Town? is an award-winning and innovative resource for teaching Social Studies developed by Edinburgh City Libraries. The resource is aimed at pupils aged between 8 and 13 and is linked to the Curriculum for Excellence, second, third and fourth levels. It is available on Glow, the Scottish schoolsâ€™ intranet and on free CD. Whose Town? looks at Edinburghâ€™s past from the 1850s to the 1950s through the eyes of people who lived there. There are 14 lives to discover who lived in Victorian times, at the beginning of the twentieth century, during the Second World War and in the Fifties. Archival material is collected in a digital box and hidden in an attic for pupils to uncover and examine. Each life is captured at a particular point in history, creating a snapshot of their life: a Life in a Box. Pupils can discover what life was like for Levi, a destitute and orphaned boy in late Victorian Edinburgh, or how nine year old Bessie became the youngest Suffragette. They will uncover Lucaâ€™s story as he established an ice cream business in Musselburgh, or learn from John what it was like to grow up in wartime Edinburgh. They can hear a first hand account from Hugh of working on Edinburghâ€™s trams in the Fifties or the early days of television from Bill. Whose Town? is a Heritage Lottery Funded project. It has been developed by Edinburgh City Libraries in collaboration with Edinburgh Museums and Galleries and Edinburgh City Archives, and has been supported by many partner organisations. To find out more, visit Whose Town? or contact the Information and Digital Team at Central Library on 0131 242 8047.